Our researchers develop customised tools for use in research and display of biological arts. As a growing number of artists, researchers and institutions engage in biological arts projects, the need for specialised tools becomes apparent. This project aims to develop low-cost technological tools and procedures that will enable artists and institutions, such as art galleries and museums, to develop and display biological arts projects. Building on ten years experience of developing and modifying specialised biological technologies and techniques for artistic ends, SymbioticA is well positioned to develop customised tools for biological arts. SymbioticA’s personnel have been involved in setting up more then 15 laboratories in galleries and museums using off-the-shelf and specially designed items. SymbioticA has also developed different types of customised bioreactors and environments for biological art projects. John Barnard and Dusty Tame – 2010: Developing a bioreactor for SymbioticA resident Svenja Kratz. 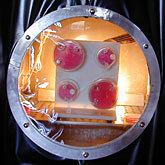 SymbioticA Research Group (SARG), Alicia King and Matt Johnson – 2008: Developed a bioreactor. Tissue Culture and Art – 2004: Victimless Leather.